The US still believes a peace deal between Israelis and Palestinians is possible by the year's end, Secretary of State Condoleezza Rice has said. But during a visit to the region, she described Israeli settlement activity in the West Bank as "problematic". Israeli Foreign Minister Tzipi Livni insisted that Israel would fulfil its peace process obligations, and that no new settlements were being built. US President George W Bush is seeking a deal by the end of his term in January. 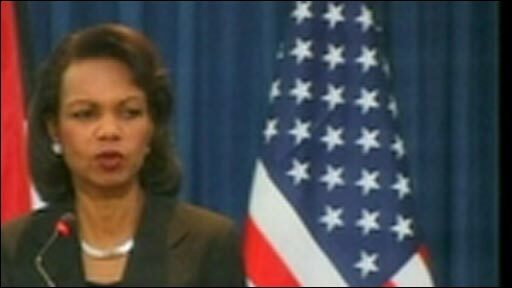 Ms Rice's visit is laying the ground for President Bush's trip to the region later this month. The current peace process, launched at a Middle East conference hosted by Mr Bush in November, has been dogged by a lack of progress. Early on Sunday, the secretary of state travelled to the West Bank town of Ramallah. Rice: "These are the first really serious discussions in seven years"
After talks with Palestinian Authority President Mahmoud Abbas, she said the US regarded the issue of the settlements as "particularly problematic to the atmosphere of trust that is needed" during peace talks. But she added that the goal of a peace agreement was still achievable this year. Mr Abbas also said failure was not an option. Afterwards, she returned to Jerusalem for talks with Ms Livni. During a joint news conference, Ms Rice said she continued "to raise with the Israelis the importance of creating an atmosphere that is conducive to negotiations". Ms Livni told the news conference: "There is no new building of new settlements", adding that her government had "no hidden agenda". She pointed to Israel's 2005 withdrawal from Gaza Strip as proof that Jewish settlements were "not obstacles" to peace. Ms Rice is due to have talks on Monday with Israeli Prime Minister Ehud Olmert. The US administration is hoping it can bring about a deal between the Palestinians and the Israelis, but correspondents say that time is running out. 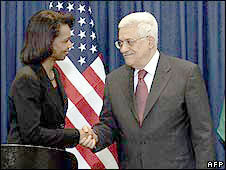 Ms Rice is raising pressure on Israel to ease freedom of movement for Palestinians in the West Bank. Mr Olmert and Mr Abbas are set to hold a bilateral meeting in Jerusalem on Monday after Ms Rice's departure. But the BBC's Kim Ghattas says that after months of talks, there is little evidence of progress as the economic situation of Palestinians, especially in Gaza, deteriorates.